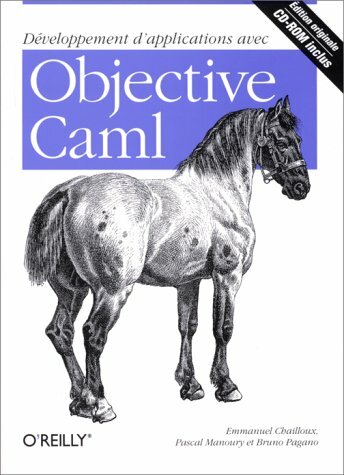 Developing Applications with Objective Caml is a preliminary english translation of a comprehensive book on OCaml, covering not only the core language, but also modules, objects and classes, threads and systems programming, and interoperability with C.
An introductory programming textbook based on the OCaml language. It is intended for newcomers and also those who know some programming but want to learn programming in the function-oriented paradigm, or those who simply want to learn OCaml. This document is an introductory course on Unix system programming, with an emphasis on communications between processes. The main novelty of this work is the use of the OCaml language, a dialect of the ML language, instead of the C language. OCaml is a high-performance dialect of ML. This book presents a practical introduction and guide to the language, with topics ranging from how to write a program to the concepts and conventions that affect how programs are developed in OCaml. This fast-moving tutorial introduces you to OCaml, an industrial-strength programming language designed for expressiveness, safety, and speed. You'll quickly learn how OCaml stands out as a tool for writing fast, succinct, and readable systems code.